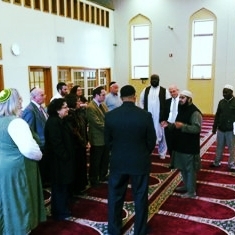 Built in 1995 through the support of local donors, Masjid Al-Islam aims to serve the religious and spiritual needs of RI Muslims. A hub of activity, the mosque offers five times daily congregational prayers, Islamic education, community activities, as well as religious advice by qualified imams and scholars. The mosque's name comes from the Arabic word "Islam" which has root meanings of "peace" and "submission." To learn more about the mosque, its leadership and activities, visit their website or contact them.